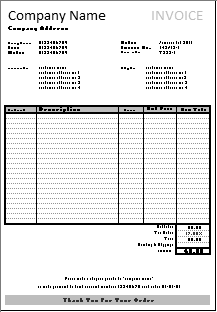 Description: Simple Excel Invoice Template that automatically calculates Row Totals, Subtotal, Tax and Invoice Total. If you enter values into the 'Product ID', 'Description', 'Quantity' and 'Unit Price' columns of the above invoice template, the 'Row Total', 'Subtotal', 'Tax' and 'Total' fields are automatically calculated. * operator The multiplication operator is used to multiply the quantity by the price per item, to calculate the totals at the end of each row in the invoice. The multiplication operator is also used to calculate the Tax. If function Used to keep the 'Row Total' column of the invoice tidy. If no value is present in the corresponding cell of the 'Quantity' column, the entry in the 'Row Total' column remains blank. Otherwise, the row total is calculated and displayed. Isnumber function Used to check if a numeric value is present in the 'Quantity' column of the Invoice. SUM function Used to calculate the Invoice Subtotal before Tax and the final Invoice Total.